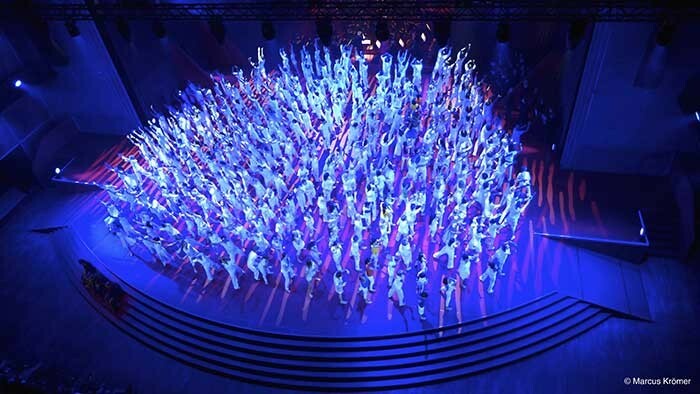 Clay Paky celebrates Bielefeld's 800th anniversary with "Zeitsprung - BI-Motion"
Germany - To celebrate Bielefeld's 800-year jubilee, the city set up the "Zeitsprung - Bi-Motion" (Time Warp - Bi-Motion) project. 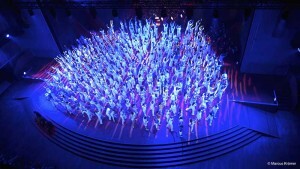 Eight hundred dancers and musicians from the city itself staged a superlative performance. The Bielefeld Dance Theatre and Philharmonic, the Syrian clarinet virtuoso Kinan Azmeh, and students and pupils from all levels and types of school were involved, as well as amateur dancers and musicians of all ages. This impressive theatre project in Bielefeld allowed those who took part to live dance and contemporary music experiences concretely. The director of choreography of the Bielefeld Dance Theatre Gregor Zöllig and his team were in charge of the project, while the Philharmonic was conducted by Alexander Kalajdzic. Tilo Steffens designed the stage layout, which was inspired by the deep red colour of the Jubilee logo. The lighting design and programming were entrusted to Marcus Krömer, who used a grandMA2 light and an MA onPC command wing for the control, and fitted Clay Paky Alpha Profile 1500s on the rig, among other lights. Krömer said: "I have been working with MA lighting desks for fifteen years and a grandMA2 light has always been essential when rehearsal times are short. I can control this desk with my eyes shut. The grandMA2 theatrical functions, in particular, and the cue part, for example, were very useful. I also had an MA onPC command wing, which was a great help as a low-cost high-performance back-up solution during the preparation and on site." Speaking about the design, Krömer said: "For a show with eight hundred people taking part on stage, it was necessary to install an independent lighting system for the city hall, since the length of the stage in the hall itself was also significantly increased." "Given the various requirements for the individual sets and limited rehearsal times, we used moving lights almost exclusively. It was important to achieve powerful, colourful atmospheres and be able to create well-defined structures using gobos. Clay Paky Profiles were the best choice for this! Setting up the lights and rig in just a day and a half was a real challenge, but thanks to the excellent cooperation with Jansen Lichttechnik GmbH & Co.KG from Paderborn, everything went well and all were satisfied! ", Krömer added. The Paderborn-based company also provided the lights.